Advertising Definition - What is Advertising? Advertising is the attempt to influence the buying behavior of customers or clients with a persuasive selling message about products and/or services. In business, the goal of advertising is to attract new customers by defining the target market and reaching out to them with an effective ad campaign. Establishing the target market is the critical first step in any advertising campaign – you need to know who your intended audience is before you can reach them. If your target audience is senior citizens, for example, an advertising medium such as Facebook is a poor choice. Similarly, Millennials are much less likely to read newspapers or use the Yellow Pages. Defining the target market involves building a demographic profile of the prospective customer by taking into account criteria such as age, gender, marital status, lifestyles, shopping habits, etc. It is also important to check out the level of competition for your product or service with your target audience as you may need to compete on price and/or service. There are many different types of advertising that are typically used by small businesses. Local website advertising: Many municipalities and Chamber of Commerce chapters have websites that provide listings of local businesses. Business web pages: Creating and maintaining a professional website with clearly outlined descriptions of business offerings, optimized for search traffic. Email: Requires a customer email list and adherence to anti-spam regulations. Email newsletters can be useful for keeping in touch with existing customers and passing on information about new products or services. Facebook: Taking advantage of social media by creating a business Facebook page and using it to regularly promote products and services. A common advertising venue for businesses such as restaurants who use Facebook fan pages to promote new menu items or specials and to receive feedback from customers. There are also a number of available 3 for doing business on Facebook. Twitter: Assuming the business has Twitter followers tweets can be used to send out short promotional messages. Newspaper advertising: While on the decline (U.S. newspaper ad revenue dropped by over 50% between 2006 and 2015) newspaper ads can still be an effective way to reach customers. Many municipalities have special interest newspapers which can be used by businesses for local advertising. Yellow Pages: Usage of the printed pages is also in decline. However, there is an online version. Direct mail: Can be very useful. Can be costly if sent via post, but even without a mailing list brochures, flyers, etc. can still be delivered directly to residences and/or businesses in targeted geographic areas. Unfortunately, statistics show that nearly half of direct mail ads are unread by recipients and tossed away as "junk mail." Cable TV and radio – Cable companies often have local info channels that offer affordable advertising for small businesses. Cold calling – By phone or in person can still be surprisingly effective. As an example, while on a call a service company can take the opportunity to visit neighboring residences/businesses and mention their services (or drop off flyers or brochures). Phone solicitation is now illegal in Canada to numbers registered in the National Do Not Call List unless the business has an existing relationship to the customer. 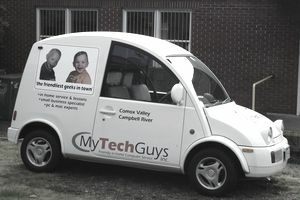 Vehicle (wrap) advertising – Turning a vehicle into a “mobile billboard” is an excellent way to maximize business exposure. Vehicle ads are eye-catching and in a major metro area can be seen over a million times a month. Online advertising continues to grow rapidly, with over $229 billion invested globally in online advertising in 2017. According to statista, this is projected to rise to $335 billion by 2020. With over 2 billion users of social networks, spending on social media ads alone has grown to over $35 billion in 2017 from virtually nothing in 2010 (spending doubled from 2014 to 2016). Social media is particularly popular with advertisers, where easy access to user demographic data (such as age, interests, spending habits, etc.) companies can finely tailor ads to the audience.